Affordable décor for our homes is in season ALL the time. 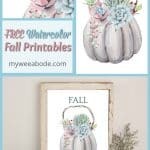 And what’s more affordable and lovely than free watercolor fall printables you can frame as wall art in your home? Autumn is finally starting to peek its sweet little head out from behind the sun in So Cal. And with cooler temps (at least in the morning), comes the itch to start changing up the décor in our homes! You can check out some more fun DIY fall décor with my Mod Podge Pumpkins>>> HERE. Sweaters, pants, throw blankets, cozy pillows, pine cones, acorns, pumpkins… these are just a few of the things that come to mind when fall starts to… well, fall! This year, I’m leaning towards a more subtle color palette for the season. Soft orange, greens, and tans are where it’s at for My Wee Abode. 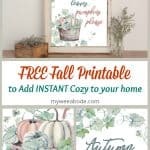 My post on Autumn Pillow Pairs is another great way to bring in seasonal color to your home for just a few bucks. 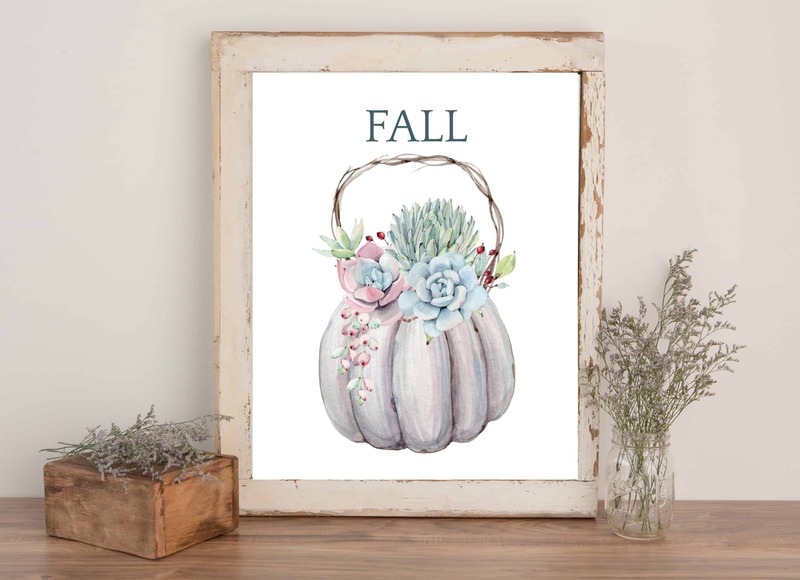 This fall printable features succulents with a touch of berries nestled in a pumpkin basket. You can print it with or without the wording! 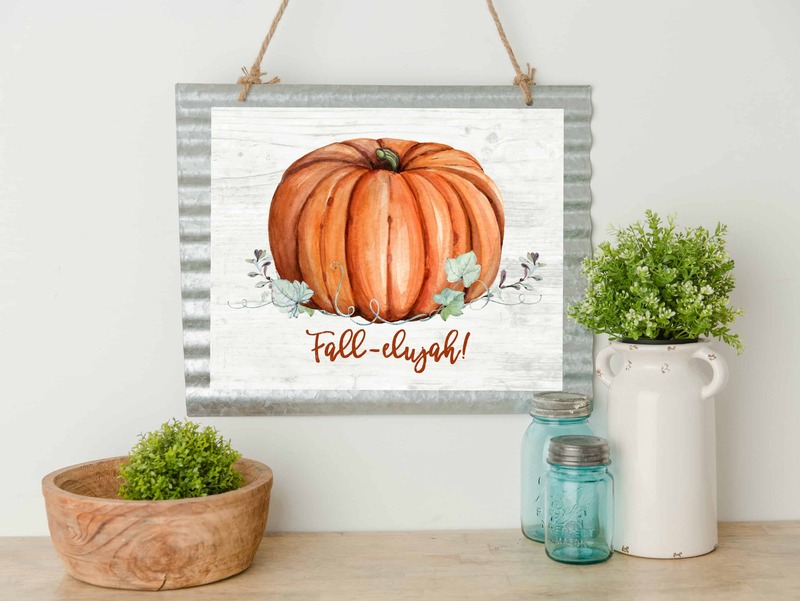 A healthy pumpkin with vines and leaves is set on a shiplap background, and shouts “Fall-elujah!” Not a shiplap fan? (Yes, there are some that are not).. Feel free to print this without the wood background! To get instant access to these three printables, simply click on the button below and fill out the form. 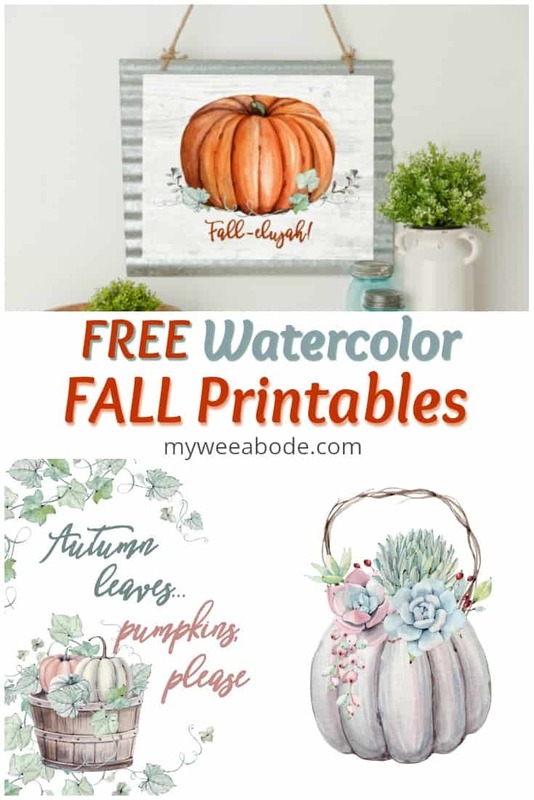 You will immediately receive an email containing the password to download the Free Watercolor Fall Printables, along with ALL the MWA printables! You’ll also receive new post notifications, newsletters, and tips and tricks for living small sent right to your inbox! To see all that’s available in the exclusive My Wee Abode library, click the button. Which printable is your favorite? Inquiring minds want to know! What are you working on to make your home cozy for the fall? Thank you, dear friend! Enjoy! When will you be in OC next? Hugs! I love the Fall-alujah! So cute! Thanks, Melan! That’s probably my fave, too! Thank you for all you did today at the shower! You are amazing! 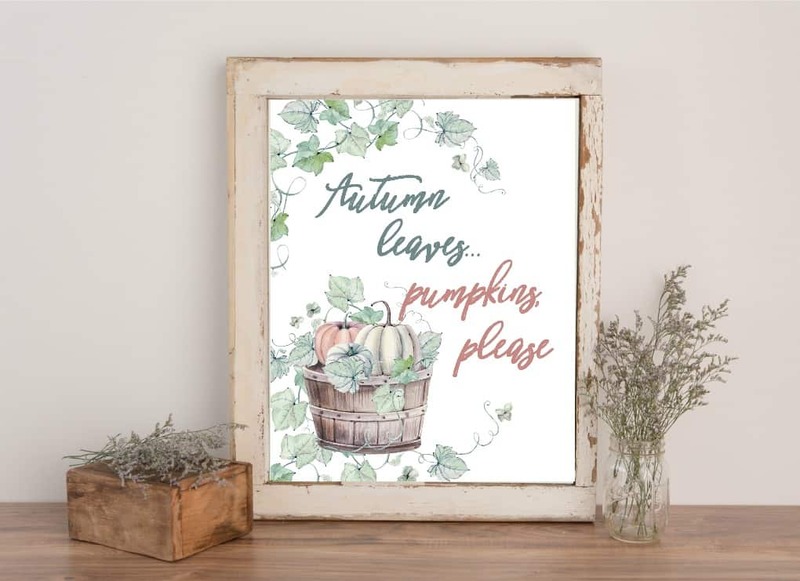 Your fall printables are beautiful! Thanks! Oh, thank you, Lauren! I hope you enjoy them! Hugs, girlfriend! These are all beautiful but the farmhouse one is my favorite. Your designs are simply breathtaking! Perfect fall design. Thank you so much, Susan! I’ll be sure to link up! Thanks so much for the invite! These are all so lovely. Such a nice collection that it would be hard to choose just one. Luckily we can display them all. Aw, Debra… you made my day! Hope lots of people use them and enjoy! Hugs! They are all so cute but the “Fall-elujah!” is my fav!!! Yeah… I think the Fall-elujah may be the fave all around! 😉 Thanks for the sweet words, Nancy! Hugs! THey’re beautiful Julie, thank you very much for sharing them. Thanks so much, Michelle! And you are so welcome! 😉 Hugs and hearts! Fun printables Julie! So sweet to share these. Hugs! Oh Julie, these are gorgeous!! And I am not sure that I can make a decision on which is my favorite… great selections! Thanks so much, Nikki! I’m really glad people are liking them! 😉 Hugs, sweet friend! Your printables are all beautiful, but I really love the blue succulents one! It’s very coastal and very you! Thank you so much, Marissa. Yes… I definitely love the colors of that one! 😉 Hugs, dear friend! Sweet printables, Julie!!! Pinned for you to my Crafts and Sewing ~ Thanksgiving and Fall board for you. <3 Love the bright big Fall-allujah pumpkin one! Thanks, Barb… the Fall-elujah may be ‘winning’! 😉 Thanks for the support! Hugs! Thanks, Kristi! You’re so sweet! 😉 You made my day! Hugs and hearts! Very pretty and just what is needed to brighten up a space! Thanks, Mary! They were super fun to make! Hugs, dear friend! Thanks so much, Danielle! You are so kind! Hugs and hearts! Yep, that’s exactly what the metal is called! 😉 Thank you for your sweet words! Looking forward to working together! Hugs! Oh, these are just simply gorgeous! You are so talented. I love the metal background you put the Fall-elujah! one on! I may need to use one of these in my home, they’re just so pretty and match my decor! Thank you! Off to pin! Oh, thanks for the encouraging and kinds words, Carrie! You are a sweetie! Let me know if you end up using any… feel free to share on my FB page! 😉 Hugs, sweet friend! These are very beautiful. I love the colours you chose. Thanks, Leanna! They were very fun to make! Hugs! These are so pretty! I love watercolors, and I can’t choose a favorite! I’ve featured them at Thursday Favorite Things. Thanks for sharing! Thank you, again, for featuring them, Pam! So kind of you! So so pretty Julie! Thanks for sharing with us at TFT. I am featuring you today. Have a great day! Thank you so much, sweet friend! I always appreciate your features! Hugs! These are all so pretty! Thank you for sharing at Merry Monday; I’ll be including your printables in my Party Features next week. Happy Thanksgiving! Oh, thank you so much, Emily! I was so busy this weekend, I didn’t have a chance to make my regular LP rounds! I appreciate your share SO very much! Have a wonderful Thanksgiving!